Have you ever had a song pop up in your shuffle playlist that makes you think, “What happened to this singer?” or, “Man, I miss this band!”? Well, lately that’s been happening to me and I’ve come to realize that there are quite a few artists and bands in my iTunes library that deserve a shoutout because, man I miss these artists! First of all, I’m going to come out and say that the best music came out of the 80s. I might not have been alive during that time, but my mom raised me on primarily 80s music. However, since I am a child of the following decade, I have an attachment to the artists who were large in the 90s and early 2000s, as well as some artists and bands that probably weren’t quite as popular as say… Britney, ‘Nsync or the Backstreet Boys. Whether the artists were well known or not-so well known, their music is scarcely heard anymore… and to me, it’s a shame. A*Teens // Starting out as the ABBA teens, the A*Teens released their first album The ABBA Generation which was a compilation of hit ABBA songs that they covered. This group did get quite some popularity after their second album was released, as they toured with Aaron Carter in 2001 and later toured with Jump5, LMNT and Baha Men. One of their most popular songs was Upside Down, and I remember seeing the music video quite often on TV during my childhood. Aaron Carter // Probably one of the most popular artists in my list. While I’m certain no one has forgotten about him, he did drop from the music scene back in the late 2000s. He first got his start opening for the Backstreet Boys in early 1997 which led to his first self-titled album released later that year. That particular album was not a fan favorite, as he was only 10 when he recorded it. His popularity really came when he released his second album ‘Aaron’s Party (Come Get It)’ from which his hit single I Want Candy (which was a cover). Though he dropped from the music scene somewhere around 2006-2007, he has since released a few songs and does some independent performances to this day. Dream Street // My all-time favorite band from my childhood/pre-teen years! Also known as the boy band that brought Jesse McCartney to fame. If you didn’t know this… go home. Dream Street was a personal favorite of mine when they hit the scene in 1999-2000 with their song It Happens Every Time, which played constantly on Nickelodeon back in the day. Sadly, the band didn’t last long due to legal issues with their manager, and in 2002 they disbanded. As we all know, Jesse McCartney was the one to shine the brightest once they disbanded, but the other boys – Chris, Matt, Greg and Frankie – have kept themselves busy with music since then… just not on the same level as Jesse. One other fun fact, was that their cover song, Sugar Rush, came out the same time as the A*Teens’ cover of the same song which caused quite a dispute between the two groups. Jump5 // Jump5 was one of the only Christian pop groups I had ever heard of in the early 2000s. Their post popular song, All I Can Do, was often heard on Radio Disney and appeared on a WOW Hits CD in the early 2000s. In 2004, one of the band members left the group, and the remaining four went on to release one new album before finally disbanding in 2007. Stevie Brock // Honestly, Stevie Brock is one of those one-album-hit wonders. He released his first and only self-titled album in 2002, which featured his hit song, All For Love. He released a few other songs for Disney soundtracks, including Three Is A Magic Number along with ex-Dream Street members, Matt Ballinger and Greg Raposo. Take 5 // I can’t say I honestly knew much about Take 5, since they did not last long. 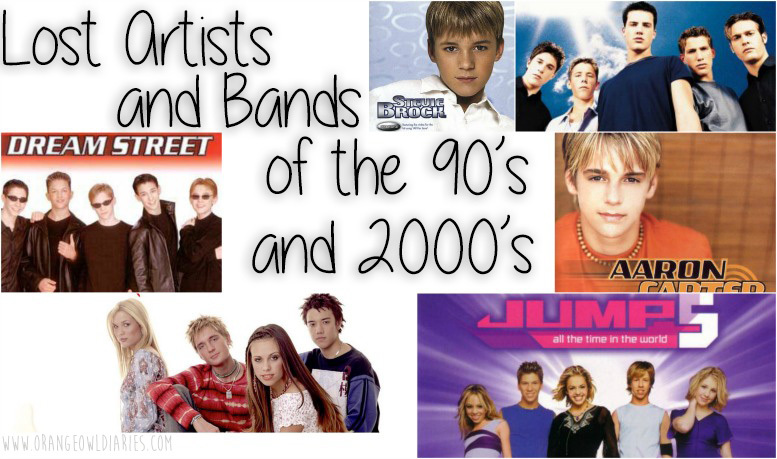 They just never gained the same popularity as ‘Nsync, Backstreet Boys or even Dream Street. However, there are a few of their songs still in my iTunes library that I occasionally listen to. I know there are probably tons more artists that appeared even earlier in the 90s that disappeared without a trace (from the music scene anyway), but these were a few that I still listen to regularly. Which artists/bands do you miss? These ones were a little after my time – Aaron Carter came in towards the end of my pop phase. The name S Club 7 looks familiar, but I can’t put any faces or music to the name. S Club 7 was an australian ‘group’ of friends transplanted to California. Their show aired on MTV and Much Music in the late 90s.